Sometimes an artist, designer or architect tries to rethink a common question. 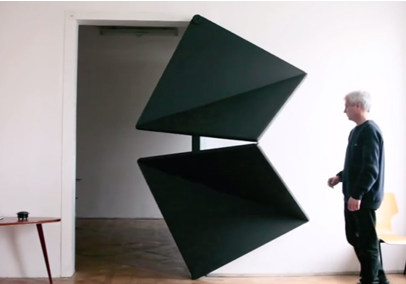 In this case it is “What is a door?” Austrian artist Klemens Torggler came up with this sort of origami door that splits in half and folds up. Instead of sliding on a track or a pivot on the corner, the panels fold into triangles as they move and then unfold back into a rectangle after it moves beyond the doorway. Is it better than a typical door? Not sure. Is it interesting and inventive. You bet. Artist Torggler has worked on it for many years and through many ideas, also known as iterations. Maybe this is the best solution possible, after all, triangles are awesome. Read more about Klemens Torggler’s project here.